OK, so it’s not exactly Shepherds Pie, but it’s pretty close. While this takes a little while to accomplish, it is worth the time and effort involved. Begin by baking the potatoes. When cooked, remove from the oven and let cool slightly so they can be handled. Carefully, cut the potatoes lengthwise. With a spoon, go around the edge of the potatoes leaving a little along the sides. Scoop out the potato and place in a bowl. 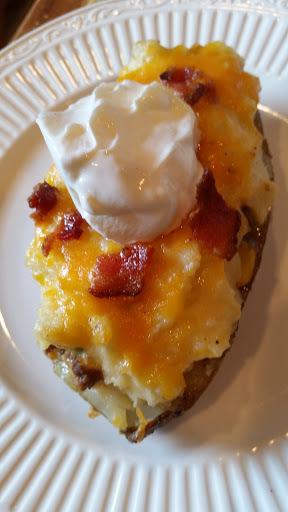 Brush the insides of the potato skins with melted butter and return to the oven for a few minutes to dry out the shells somewhat and the inside is lightly toasted. 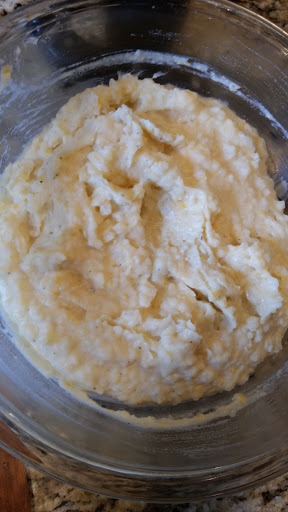 Make mashed potatoes according to your family’s liking. I add butter, cheese and half & half to ours. The amounts will vary according to the amount of potatoes you have. You want the mashed potatoes to be rather stiff so they will stay formed on the top. Add salt and pepper to taste and test for seasoning. Adjust as necessary. Meanwhile, prepare the shepherds pie filling. In a large saute pan (I poured off the grease and used the one I had fried the bacon in), saute the onions for 2-3 minutes until they are tender but not brown. Add the hamburger and continue cooking until the meat is cooked through. Sprinkle the meat with the flour and let it cook for a couple of minutes. Add the beef stock, Worcestershire Sauce, thyme, red pepper flakes, peas and corn. Stir well and let simmer 5-7 minutes until the sauce begins to thicken. 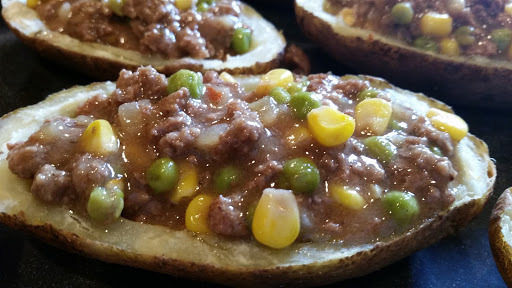 Spoon the meat mixture into the potato skins. Cover with the potatoes. 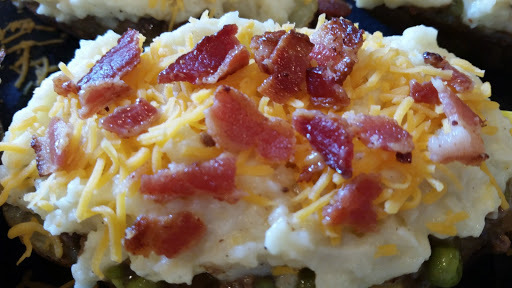 Top with additional cheese and the crumbled bacon. Return to the oven and bake until the cheese is melted and they are heated thoroughly. Serve with sour cream, green onions, or toppings of your choice.